MADRID – Hot air from Africa is bringing a new heatwave to Europe, prompting health warnings about Sahara Desert dust and exceptionally high temperatures that are forecast to peak at 116.6 degrees Fahrenheit in some southern areas. 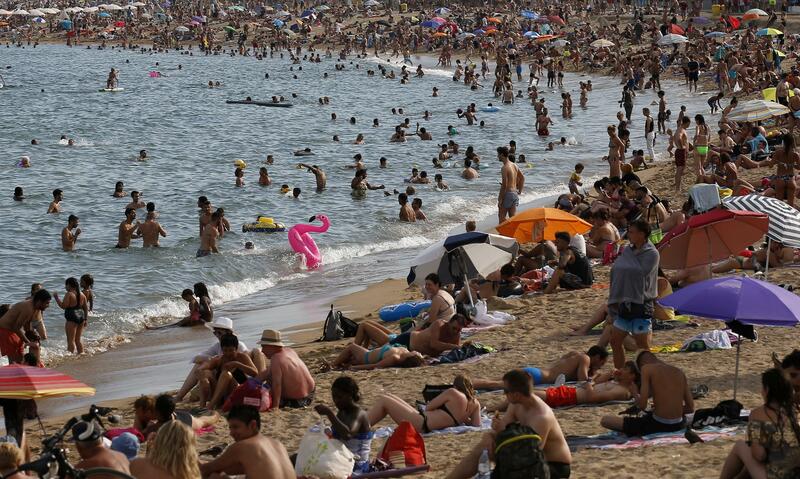 The torrid weather prompted public service alerts in Spain and Portugal. Temperatures were forecast to reach 111 degrees Thursday in the Portuguese city of Evora, 81 miles east of the capital of Lisbon, and in the Spanish province of Badajoz, across the border. A hot air mass was moving northward from Africa, authorities said, warning that the mercury could peak at 116.6 degrees Fahrenheit this weekend in the southern Portuguese town of Beja. Portuguese authorities issued a nationwide health warning, including for dust from the Sahara Desert. Warnings were also issued for 40 of Spain’s 50 provinces. Up north in Sweden, the country’s official tallest point is set to change amid record temperatures. Scientists said a glacier on Mount Kebne, the Scandinavian country’s highest peak at 6,925 feet, 10 inches, is melting and is no longer Sweden’s tallest point. Gunhild Rosqvist, a Stockholm University professor in geography, said the glacier lost 13 feet, 2 1/2 inches of snow in July alone as Sweden endured record temperatures that triggered dozens of wildfires, even in the Arctic Circle. In neighboring Finland, a supermarket came up with a novel way of escaping the heat. The K-Supermarket said on its Facebook page that patrons hoping to cool down could sleep overnight in its air-conditioned store in Helsinki. Homes in Finland are designed to handle the extreme cold and dampness typical of the Nordic region, not the recent high temperatures. In eastern Europe, Poland endured unusually high temperatures up to 93.2 degrees, forcing its power plants to go into emergency mode to increase output due to the wide use of air conditioning and electric fans. In the streets of Warsaw, the Polish capital, authorities placed cooling water installations around and advised people to stay indoors. Dozens of the country’s Baltic Sea beaches have “no swimming” warnings due to health risks from algae blooms. Farmers across the continent were battling the effects of drought, so the European Union offered to speed up funds to help them cope. German farmers have already asked their government for $1.17 billion in financial aid to help cover losses from this year’s poor harvest. Published: Aug. 2, 2018, 8:40 a.m. Updated: Aug. 2, 2018, 5:55 p.m.